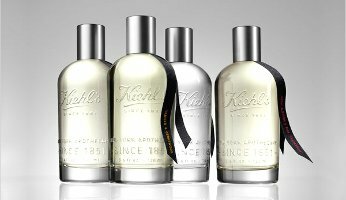 Last month, Kiehl's launched a new family of products called Aromatic Blends, "Pure Scents from Around the World." I was initially uninterested in trying them, since I have bad memories of Molton Brown's similarly travel-themed "Navigations Through Scent" line (harsh compositions, ugly bottles and prices even more ridiculous than their names). However, I do enjoy visiting the Kiehl's counter once in a while, and once I'd sniffed the Aromatic Blends, I was ready to adjust my original reaction. The four "blends" in this line are Nashi Blossom & Pink Grapefruit, Orange Flower & Lychee, Fig Leaf & Sage and Vanilla & Cedarwood. I'm not really sure how "naturally derived" or "sustainably sourced" they are, but I do think their simple, landscape-inspired arrangements suit the overall Kiehl's aesthetic. They're nicely made (with one possible exception), they're simply and attractively packaged, and they're reasonably priced — in other words, they do what they set out to do. Here are a few quick thoughts on each fragrance, from lightest to richest. Nashi Blossom & Pink Grapefruit: Let's get this one out of the way first. The nashi blossom is meant to evoke the pear trees of the peaceful Kyoto Gardens with the refreshing sensation of pink grapefruit from Brazil. Additional notes include ginger and mandarin orange. I imagined this fragrance as something that Scarlett Johansson could wear in the Japanese garden scene of Lost In Translation, but instead it turns out to smell more like a trip to Sephora: a very "pink" mix of sweet citrus, a few plasticky flowers, and a sheer musk with limited staying power. Orange Flower & Lychee: This "blend" was my favorite in the quartet. It's not really an orange blossom fragrance (and you certainly won't confuse it with L'Artisan Parfumeur Séville à l’Aube), but it's a very wearable fruity-floral for warmer weather. It starts with juicy notes of lychee and blood orange and it gradually shifts into a honeyed rose-based floral with some tart-sweet lychee remaining around the edges. A Kiehl's sales associate at Bergdorf Goodman told me that this has been the most popular fragrance of the four, so far. Its overall feel reminds me a bit of the fruit-and-flower scents in Sarah Horowitz's line. Fig Leaf & Sage: How many fig-dominated fragrances are available these days, besides the classic Diptyque Philosykos and L'Artisan Parfumeur's Premier Figuier? Fig Leaf & Sage is a more moderately-priced scent that could entice quite a few fragrance shoppers to give fig a chance. I'm not really picking up on any herbal notes, but I do like this blend's emphasis on the coconut-milk aspect of the fig in addition to its duskier, woodier side. Fig Leaf & Sage is the most masculine scent in the Aromatic Blends collection, and even though I'm not generally a fig person, I found it nicely composed. Vanilla & Cedarwood: I wasn't surprised to see a vanilla-inspired fragrance in the group, since vanilla's fans are legion, but I was surprised by the fragrance itself. It's not a dessert-y vanilla: it's a creamy scent that owes as much to the vanilla orchid as it does to the pod, with hints of amber and woods. If you enjoy wearing L'Artisan Parfumeur's Vanilia or similar smoky, milky-sweet vanillas, you'll want to try Vanilla & Cedarwood. This one also happens to have excellent longevity. None of the Aromatic Blends has the devil-may-care, funky quality of Kiehl's Original Musk, and I don't love any of them as much as I loved the distinctive sweet-herbal Coriander. (Why did Kiehl's discontinue the Coriander fragrance oil?! At least the body products are still available). They seem to be targeting shoppers who don't typically wear "perfume," especially since they avoid that terminology by calling themselves "Aromatic Mists." They're a good stepping-stone between typical department store offerings and more "niche" lines, sort of like Jo Malone for a different audience. They're going on my list of easy-to-find recommendations for people who want to start learning more about fragrance, which is never a bad thing. Kiehl's Aromatics Blends sell as 30 ml ($40) and 100 ml ($75) "Aromatic Mist" (which I'm guessing is similar to an Eau de Toilette). Matching Body Cleanser and Body Lotion are also available for each scent. For purchasing information, see the listing for Kiehl's under Perfume Houses. I tried three of these (Orange, Fig, and Vanilla) at Nordies the other day and was sorely disappointed. Fig was an absolute scrubber. I had such high hopes. Really? I found the Fig pretty easy to wear, even though I don’t normally care much for fig notes. I had the opposite experience: I actually expected to dislike all four, and ended up enjoying three of them. Vanilla and cedar sounds nice. Not sure about the orange flower one. The other two don’t sound like something I’d like. I have a feeling that they would be a little light for my taste but you never know until you try them I guess. I was a fan of the Coriander oil too. They *are* on the light side, because they’re probably directed at people who don’t want to wear PERFUME, as such…! They’re nicely done, but I’m pretty sure they’re not aimed at long-time fragrance obsessives with a taste for vintage perfumes. Oh, I don’t know about these new scents. I loved the original Keihls oils: Musk, Ambegris (sp? ), Hot Stuff, Pear and others. I still have partial bottles of these scents in the brown medicine bottles and they are still going strong. Since Keihls is now owned by Estee Lauder, I am dubious about loving any new scents. Maggiecat, it was *very* long-lasting on me, even when I only applied a spritz! Jessica thanks for the great review. Kaos, I hope you’ll like one or two of them! It’s interesting to read other’s reactions to these new perfumes. The Nashi Blossom & Pink Grapefruit wasn’t out yet when I was in Kiehls in July but I very much liked the Vanilla & Cedarwood. Maggicat, it’s so funny that you thought it was very strong; I wish it were stronger. Maybe my skin just soaks it up?? I’d like to buy the lotion (which felt luxuriously creamy) and the perfume so that I can layer them. The SA said they’ll be coming out with a coffret with all four scents sometime in August. Perfumista8, the four blends appeared gradually in NYC, too, apparently. I didn’t know about the coffret! That’s a good idea. Thanks for your review, Jessica. Your post reminded me to try the samples I got from Nordies. I have 3 of the 4 — the Nashi Blossom / Pink Grapefruit was not available a few weeks ago but I will check when I’m there next. So, overall, I am not impressed. At least you’ve given them a fair try! I swung past Nordstrom yesterday to smell these (among other things) and was so disappointed that they didn’t have an oil, I didn’t bother. I loved Kiehl’s classic oils, but that formulation seems to have gone the way of other classic Kiehl’s formulas now that they’ve been acquired (I forget who acquired them). But, I was able to assuage my disappointment at Anthropologie. Anthropologie is an easy place to assuage one’s disappointments! oh how i miss kiehl’s cucumber! that was a beautiful scent. i’m sad to hear about coriander now too. i hope the body products stick around. i don’t like what loreal has done to kiehls at all. it’s true that it’s been a very gradual change, but i can’t think of any good changes they made! changing the name of the hair products to ‘kiehl’s stylist series’ and putting that flash of yellow on the bottles was so drugstore!